It is now possible to invoke SOLO, the Bodleian Library’s search interface, from within WebLearn and, at the click of a button, import any citations into a WebLearn Reading List. 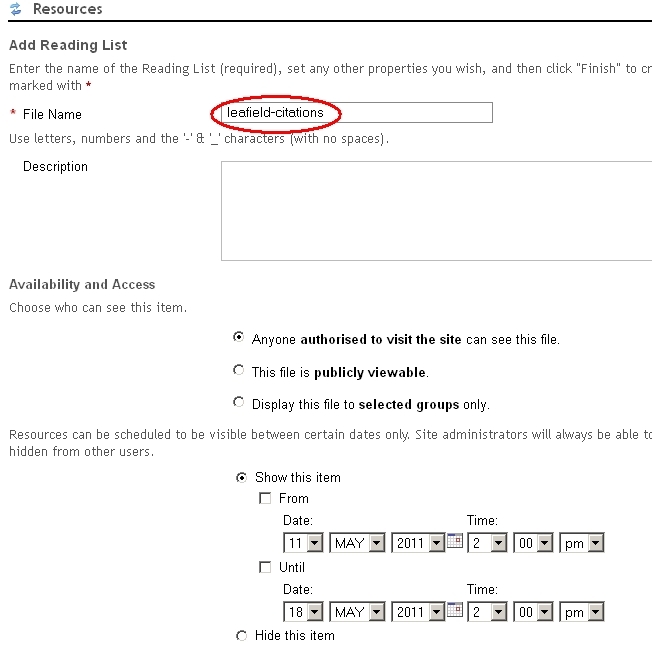 When viewed by a student, the Reading List will contain up-to-date availability information and links to full text versions of Journal Articles. First of all you need to create a new Reading List from within the Resources tool. 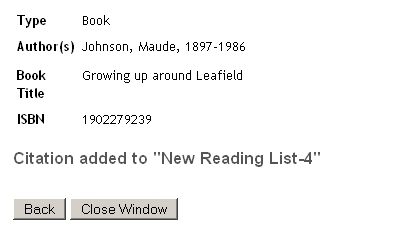 Navigate to a suitable folder and then select “Add > Add Reading List”. 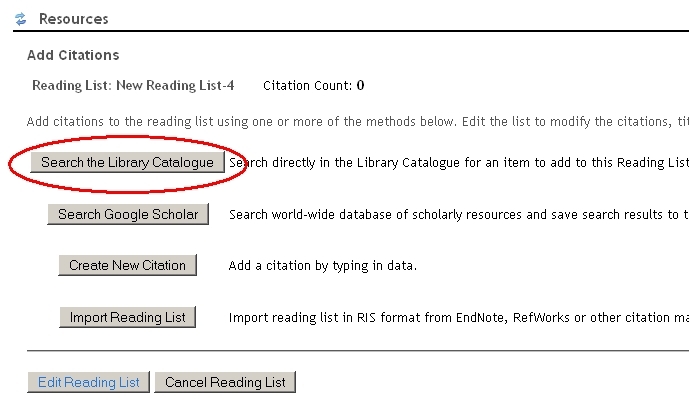 You may search the library catalogue or Google Scholar or import an existing Reading List in RIS format (End Note and Refworks). 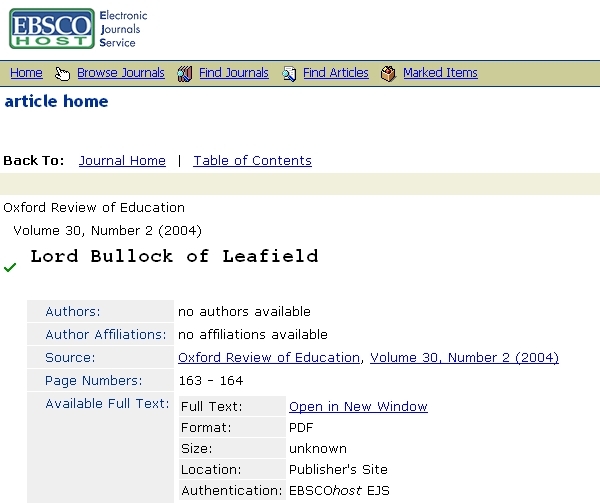 In this example we are going to use SOLO to find books and Journal articles. 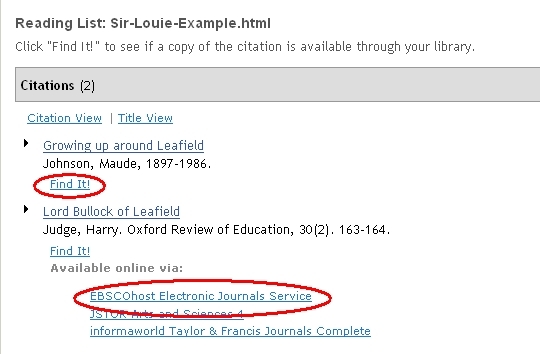 One the SOLO search page you can search for a book by typing a search term in the “Oxford Collections” text box. Remember to click the Search button. Matching items will be returned and each will contain an “Import into WebLearn” link. Click on this to push the item into you Reading List. You will see a confirmation screen. You may also search the Journal Catalogue. 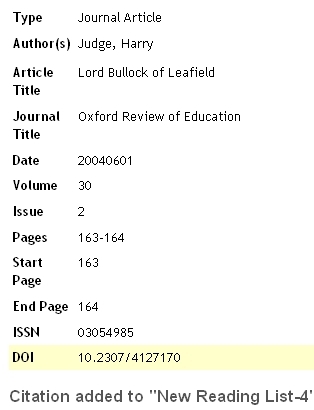 “Oxford Collections” finds (full) journals by title (e.g. The Spectator, Nature, English Historical Review) but does not find individual articles within journal (e.g. Prof blogs article on x in the Specator). “Journal articles beta” should be selected for journal articles. To find an individual article, select the Journal Articles tab. To add the article to your reading list, click the “Import into WebLearn” link. Again there will be a confirmation screen. 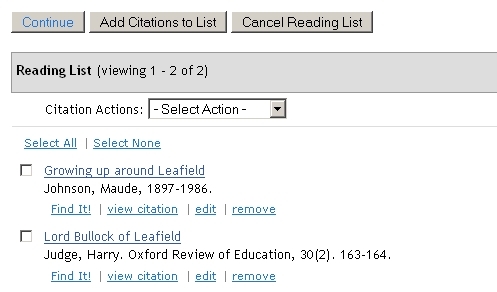 Back in your WebLearn browser window, you will see that the Citation Count now shows two entries. You need to click on the “Edit Reading List” button to view the Reading List (and then save). The “Tutor View” of the Reading List will now look like this. Click “Continue” to move to the “Save” page. Give the file a sensible name. This page also allow access to be configured. The Reading List has a URL and which can be circulated or maybe a Web Content link could be made.This is what the list will look like to the student. The “Find It” link will show availability. For journals they will be links to the full text. These links are dynamic so if the full text URL ever changes, the Reading List will NOT need updating. Addition of the class ‘WLTab’ to the <li> element wrapping the ‘Additional Services’ tab heading in the Primo Central resuls page. This was achieved by modifying the default results tile for Primo. By default, the results are built up dynamically from resultsTile.jsp. This file resides in: fe_web>tiles (full path: /exlibris/primo/p3_1/ng/primo/home/system/thirdparty/openserver/server/search/deploy/primo_library-app.ear/primo_library-libweb.war/tiles). The following changes are made to the tile. The following change is to generate the additional class only when the first tab is the “Additional Services” tab (internal name: getit_link2). However, we also want to add the class WLTab to the “Additional Services” tab when it is not the first tab. For this reason, we modify another part of the code. The approach we decided to take was to use Juice to add the functionality, and use DAIA as the format for the availability information. The intention is that using Juice, this functionality could be added to any web environment displaying bibliographic information that can speak to a DAIA compliant availability service. The result is documented at http://juice-project.org/node/41 (with a few screenshots). If anyone wants to have a go at implementing in an independent environment I’d be very happy to work with them on it and make sure it works. Biggest issue was with online vs physical availability. DAIA doesn’t allow (as far as I can see) you to make this differentiation explicit. Which means that if you have a ‘loan’ service with a ‘href’ there is no way of knowing if you have a loanable physical item with a url to some service/display (e.g. reservation, record in OPAC) or an online item with the link to the full-text. We had to work around this by setting up two DAIA services – one for ‘online’ availability, and one for other availability. The Juice extension is designed to allow different display of ‘online’ and ‘other’ as well – partially driven by this issue. A second issue is that the use of ‘available’ vs ‘unavailable’ with ‘delay’ and ‘expected’ respectively seems slightly unclear to me. It feels like saying something is ‘unavailable until’ or ‘available only after this delay’ are basically the same thing? Aside from this categorise things as either ‘For loan’ or ‘For reference’ – essentially stuff you can take away or stuff you can only use in the library. This is a slightly false division and doesn’t reflect some subtleties like stack request services, but in terms of summarising the available options for an end user it feels like enough – after all for physical items they are going to have to visit the library anyway. Due to the nature of the service and the available information in this instance all ‘available loans’ are counted as ‘copies for loan’ – so the service summarises overall availability, not current availability (i.e. 3 copies, 2 currently on loan). Clearly being able to express this would be ideal, but we don’t have access to this level of detail from the library systems in question at the moment – which puts the problem of displaying this information in an understandable format to one side for the moment. We will hopefully get a link added to http://juice-project.org/extensions_bazaar in due course. The code developed here has been added to the Juice source tree at http://code.google.com/p/juice-project/source/browse/#svn%2Ftrunk%2Fextensions, so anyone downloading the full Juice version will get it. Possible values of ‘format’ are json, jsonp and xml (not supported yet), default value is json. callback parameter only applies to format jsonp, default value is callback. Response: Requested information in requested DAIA format. Possible format values are json, jsonp and xml (not supported yet), default value is json. callback parameter only applies to format jsonp, default value is callback. The purpose of this middleware is to find availablity for items that are electronic. The API that can return information about these items is a hosted service run by SFX. 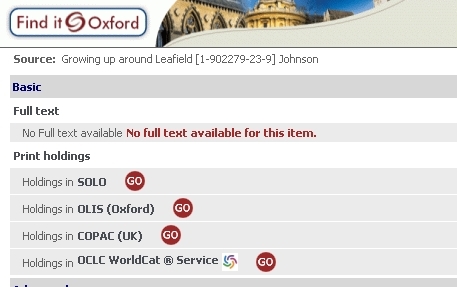 A good way to see examples of the service in use it to visit SOLO, http://solo.ouls.ox.ac.uk/, search for a item in the Journal Articles section and then click on the additional services tab for one of the results. Clicking on the “Open source in a new window” pops it out and allows you to see the URL. Next add &sfx.response_type=simplexml to the end of the URL and you get back details about the item. As an example try http://preview.tinyurl.com/5sosem7 . The idea is that EIAS will receive a request for details about an item, rather than being passed a URL, it will get an OpenURL, which it can send through to the SFX service and then translate the returned response to DAIA to that the client can parse and easily understand it. In the existing setup the only way of identifying the originating Primo record is by examining the rft_dat element of the OpenURL. As rft_dat is simply an arbitrary string, this is not a preferred mechanism for storing the id for the Primo record, and so rft_id is seen as more appropriate. The rft_id must be a URI according to the OpenURL v1.0 specification. Additionally when using DAIA to return availability information for a resource, a URI must be used to identify the resource, therefore it makes sense to assign a URI when creating the OpenURL in Primo. For ‘local’ items (i.e. not those available via Primo Central) an encoded http URI providing a persistent link to the Primo record has been added to the OpenURL generated for the record as a rft_id. This was achieved by modifying the default URL templates that primo uses to establish OpenURL. These are changed in Back Office > Advanced Configuration > All Mapping Tables > Sub System “Delivery” >Templates. Changes are made for openurl, openurlfulltext, openurl_journal, openurlfull_journal, openurl_article and openurlfull_article keys. Addition of the class ‘EXLMoreTab’ to the <li> element wrapping the ‘Additional Services’ tab heading in the Primo Central resuls page. The following changes are made to the file. The following change is to generate the additional class only when the first tab is the “Additional Services” tab (internal name: getit_link2). New lines of code are highlighted. Addition of ‘Add to WebLearn’ icon, text and link to each Primo record in the case the user had triggered a search of Primo from a WebLearn Citation Helper to build a reading list. The link should be an OpenURL with the base URL being a WebLearn URL which could be defined when the Primo search was triggered from the WebLearn Citation Helper. In order to allow the addition of resources to WebLearn Citation Helper lists from Primo, only when the context was appropriate, using a standardised metadata format. Ensure that the weblearn.js script is called from the home screen, brief results and full results – we made this change on primo-s-web-2 but I’m not sure if we just put the call into the pages directly, or from another script.